A captive zebra of the species Equus quagga (plains zebra). There are three species of zebras, but none of them are a match for their predators, which include lions, spotted hyenas, and when crossing rivers, Nile crocodiles. Their foals are also prey of hyenas, dogs, cheetahs, and leopards. 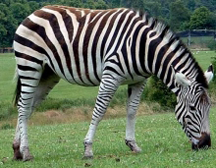 Zebras survive against their predators mainly through flight in herds. If a predator manages to isolate an individual and tire it, the probability of survival drops dramatically, because zebras simply cannot match their predators in direct confrontation. A common metaphor applied to the bully-target dynamic is that of predator and prey. This metaphor is extraordinarily misleading, because unlike actual predators and their prey, bully and target are individuals of the same species. While predators and their prey are differently endowed, bullies and their targets have almost identical capabilities. That's why targets who choose to can use counterattacks very effectively to bring an end to the perpetrator's abusive behavior. Photo courtesy Chaman Singh Verma of the U.S. Department of Energy. When bullies engage their targets, they do more than humiliate, abuse, or apply violence — they build and maintain their advantage. The bully seeks confrontation only in topic areas and settings where targets are relatively incapable of defense, and certainly incapable of counterattack. "Standing up to" the bully usually fails. To end the bullying, targets must not wait to be attacked. They must seize the initiative to mount an effective counterattack. Here is a set of guidelines for ending the bullying, using OODA as a guide. In this Part I we focus on seizing the initiative. Defensive strategies don't work. In terms of the OODA model, the bully seeks positional advantage, and maintains a position "inside the target's OODA loop." That is, before the target can counter a bully's action, the bully will have acted to block the target. For example, bullies know and prevent whatever their targets might try to do in defense, by positioning the target unfavorably in the minds of bystanders, and by readying exonerating explanations for their own behavior. They limit their targets' access to supervisors, wavering bystanders, or information the target could use to support a claim of abuse. The bully has prepared for and rendered ineffective whatever the target might try to do in defense. That's the main reason why defense is ineffective. Counterattack is essential. The "D" in OODA stands for Decide. When we consider responding to the bully, we assemble our options and select from among them. Any reticence about counterattack affects not only how we select from among our options, but also the list of options we assemble. Targets reticent about counterattack tend to consider options biased in favor of defense. They select for execution less aggressive options. Reticence about attacking is healthy in everyday life, but when being bullied, such reticence is self-destructive. Targets who deal effectively with the source of this reticence are more likely to choose effective responses to the bullying. targets maketoo feebly is a common error targets make. Bullies know that counterattacks are possible, but since they select "easy" targets, they usually expect feeble counterattacks, if any. Would you like to see your comments posted here? rbreneihjcuiaZYXAtRBtner@ChacPtdfPKkUXmYZxlBnoCanyon.comSend me your comments by email, or by Web form. I offer email and telephone coaching at both corporate and individual rates. Contact Rick for details at rbrenWbmXCnjxLsjVFiimner@ChacIDuFQRJINZlyoLBooCanyon.com or (650) 787-6475, or toll-free in the continental US at (866) 378-5470.